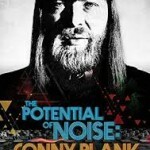 Share the post "DVD review: CONNY PLANK – The Potential Of Noise"
To be honest I hadn’t heard of Conny Plank before watching this film, and to be even more honest I don’t feel I know much more about him after watching this. However, I do now know that he is one of the most influential sound engineers and record producers of the 1970’s and ‘80’s. From 1973 onward Plank helped to innovate and shape German modern music through his work with, amongst others, early Scorpions but it is his work with Nue! and more importantly Kraftwerk that changed the face of the musical landscape for many an emerging artist, as the list of artists he worked with after that will prove. It is through Conny Plank’s son Stephan and producer Milena Fessman that we get to hear about this influential career that was cut short in 1987 by his untimely death. Plank’s career included ground breaking work the likes of Devo, Killing Joke, Ultravox, The Eurythmics, Kraftwerk, The Scorpions and a whole lot more New Wave and European bands to boot. It is through interviews with some of the artists involved that we get to understand what an important part of their sound Plank helped to shape. You just need to listen to Ultravox frontman Midge Ure describe how Plank transformed their biggest hit “Vienna” to get an understanding of what a creative genius Plank was. This entry was posted in All Posts, DVD REVIEWS and tagged Conny Plank, DVD, KRAFTWERK, review, Scorpions, The Potential Of Noise. Bookmark the permalink.